Why See Alvin Ailey American Dance Theater - 60th Anniversary Gala? The famed dance company begin their new season with special one night only performance, which will feature the premiere of a new multimedia piece, alongside Ailey's Revelations performed in full. Designated by Congress as 'a vital American cultural ambassador to the world', Alvin Ailey and his group of African-American dancers performed for the very first time at the 92nd Street Y in New York City. Since then, they've established themselves as one of the most eclectic and diverse dance companies in America. The company's performances are a whirlwind of ballet, jazz, rumba and experimental dance, offering a uniquely African American rumination on the grand sweep of history. Image credit: AAADT's Jacqueline Green and Michael Jackson Jr. Photo by Andrew Eccles. Sound good to you? 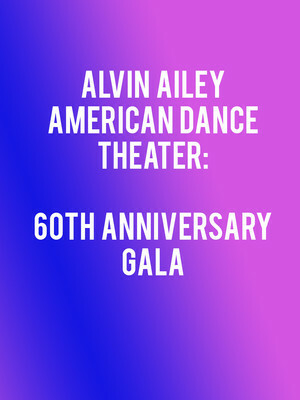 Share this page on social media and let your friends know about Alvin Ailey American Dance Theater - 60th Anniversary Gala at New York City Center Mainstage. Please note: The term New York City Center Mainstage and/or Alvin Ailey American Dance Theater - 60th Anniversary Gala as well as all associated graphics, logos, and/or other trademarks, tradenames or copyrights are the property of the New York City Center Mainstage and/or Alvin Ailey American Dance Theater - 60th Anniversary Gala and are used herein for factual descriptive purposes only. We are in no way associated with or authorized by the New York City Center Mainstage and/or Alvin Ailey American Dance Theater - 60th Anniversary Gala and neither that entity nor any of its affiliates have licensed or endorsed us to sell tickets, goods and or services in conjunction with their events.